There are few routes to reach Savandurga.Take the Mysore road till Ramnagar and then take the Ramnagar - Magadi road. Savandurga is about 3.5 kms from this road. An alternate option is to take the Bangalore - Magadi road and then turn towards Magadi - Ramnagar road. But, the shortest from Bangalore will be to take the Mysore road past Kengeri, till the Raja Rajeshwari nursing college and then take a right towards Big Banyan Tree (Dodda Alada Mara). This road will finally reach the Ramnagar - Magadi road via Manchinbele. Soon,as you hit the Magadi - Ramnagar road ,just a couple of kms ahead,you will spot the right turn towards Savandurga. The road from here is not in a good condition but you can get a clear view of the Savandurga hills. You can spot a trail where Ten minutes from here,you will be at the Narasimhaswamy temple which is at the foothills of Savandurga hills. The trail to the top of Savandurga starts from here. There is an easily identifiable trail leading to the base of the hill and then you have to walk on a rocky trail.The trail is clearly marked in yellow paint and it is easy to have any more adventure!. Most of the trail is on the rock with very little vegetation in between. At some places, especially in the beginning, the climb is steep and grip is not very good, making it a little precarious. But gradually you'll get used to walking on the rock. The first landmark is a pair of frangipani trees. The trees has shed all its leaves and looked quite good. The terrain being quite rocky, there is hardly any vegetation - except for some small grassy patches and even fewer shrubs. In some places, you'll notice small pools of water accumulated in burrows on the rock face. By an hour climb from here,you can reach the next landmark - a mantap made of granite columns with a single entrance to the east and three on the west.You can take a longer break here. There will be two trails in front of you - one in to the forest and the other one out in the open.The trail leading to the forest is a dead-end with a Hanuman carving on a rock.You can spot the top of the adjacent hill, right next to the peak. 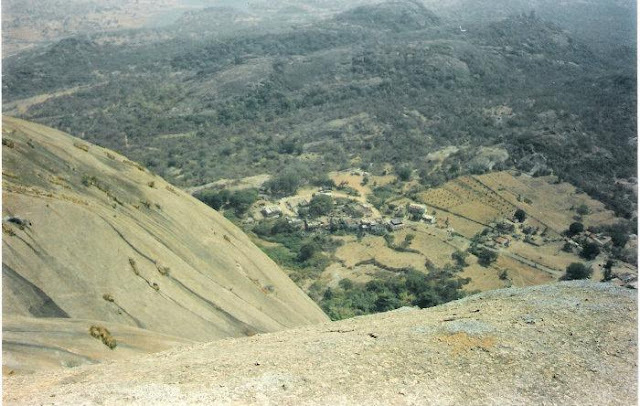 As you start your climb, soon, you can reach that hill, with an open view of the valley on the southern side of Savandurga. The Billigudda peak - with a white temple tower at the top - looks quite close from here. You have to get down slightly and then climb up again through a trail lined with boulders. 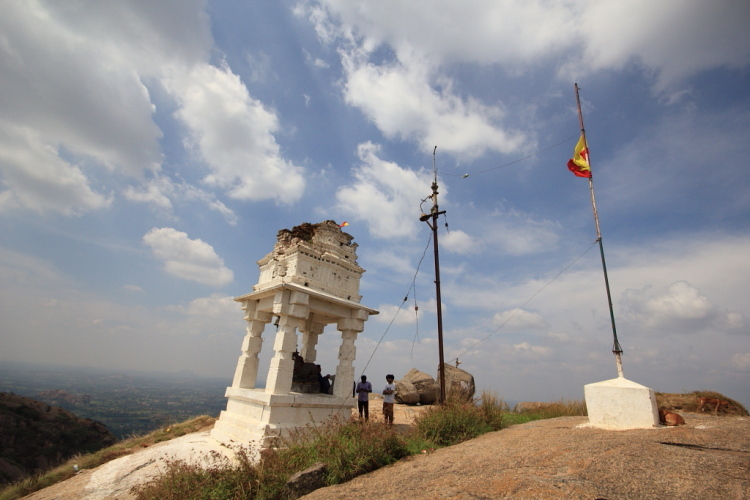 But, it is just a matter of a few minutes before you reach the Nandi tower, painted in white, on top of the Billigudda peak.This peak offers a good view of the valley all around you - the only hill with a compareable height is the Karigudda peak, standing tall towards the west. 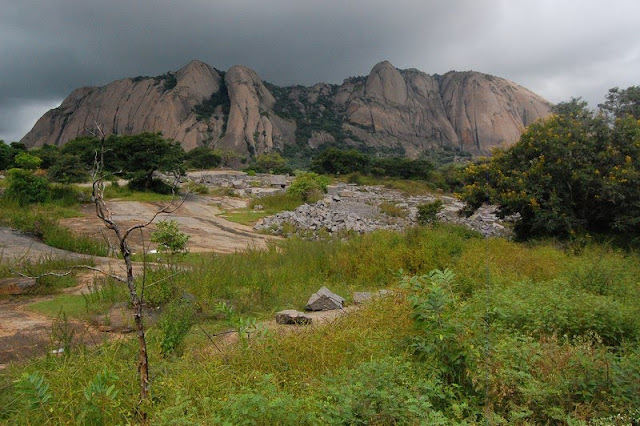 Karigudda is not totally rocky as Billigudda and one would have to go through a forest trail to get to the peak.Its the peak which is quite difficult to conquer which takes 4-5 hours of a climb to reach the peak. The return is very brisk - even though the rocky trail does not offer much grip, it will not deter. 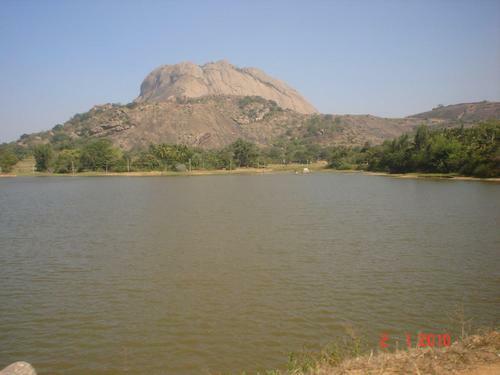 You can reach the base in less than half an hour from the biligudda peak and 1.5-2 hours including that of karigudda. After reaching the base,you can take the same way which is considerably quite easy route to reach Bangalore.